Fans of the One Laptop Per Child program were shocked and saddened to hear of the organization's imminent demise this week. There's only one problem: OLPC isn't actually dead. Despite what some blogs are reporting, the organization is alive and well… just not as alive and well as it once was. That sounds very grave, but it is not entirely correct. We reached out to OLPC to ask about the organization's apparent demise. They're still alive! However, it does sound like they've scaled back operations significantly since first making headlines nearly a decade ago. OLPC executive vice president Giulia D'Amico told Gizmodo that the organization just finished distributing laptops at schools in Costa Rica and will deliver the first 50,000 units of the XO-4 Touch tablet which runs Android. They're also selling the tablet at big box shops like Amazon, Toys'R'Us, and Walmart. OLPC also has outsourced many of the software and development units because the organization is becoming more hardware and OS agnostic, concentrating on its core values – education. As an example, we've partnered with the Smithsonian Museum to bring feature-rich, interactive and more targeted content to our young learners. So wait, what? 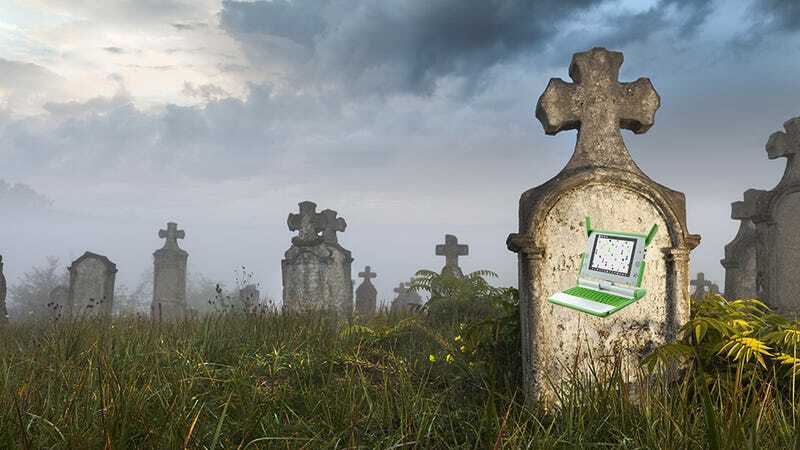 OLPC is dead, but OLPC projects are ongoing? This is all a little confusing. It's probably safe to say that the organization's once-bombastic mission to put a laptop in the hands of every child is evolving. OLPC been opting for tablets for some time now, and it sounds like the organization is more focused on partnerships than building cheap laptops.